From the first photographer of Rolling Stone Magazine with JIMI HENDRIX 1968 - 1970 Baron Wolman saw the music. His iconic music photography included shots on-stage with Jimi Hendrix, backstage with the Rolling Stones, and in front of the stage with Jim Morrison and Janis Joplin. Grace Slick and the Grateful Dead performed for the camera in his studio. Baron Wolman was Rolling Stoneâ&#x20AC;&#x2122;s first staff photographer. From 1967 through the early seventies, his pictures have appeared in virtually every issue. E X P E R I E N C E U N R I VA L L E D QUALITY Soaring above Amsterdam’s rooftops, step into a calm and composed realm of fine dining at Ciel Bleu Restaurant. Situated on the 23rd floor of Hotel Okura Amsterdam, Ciel Bleu holds two Michelin stars for its international cuisine led by chefs Onno Kokmeijer and Arjan Speelman. Attentive, amiable staff are on hand to welcome and guide you through the seasonal menus showcasing the creations of Ciel Bleu’s world-class chefs, alongside exclusive vintages from the award-winning wine list. For a rare glimpse into the workings of a two Michelin-starred team, reserve the Chef’s Table overlooking the heart of the kitchen. Visit www.okura.nl/cielbleu for more information and reservations. Welcome to the perfect City break, San Sebastian. WOâ&#x20AC;&#x2122;GOA Foundation Ambassador An inspirer, innovator and perfectionist - Grant encompasses all the qualities that deserving children can glean from a role model! ©IZZY Publishing Pvt. Ltd. All rights reserved. Editorial material and opinions expressed in WG™ digital publication do not necessarily reflect the views of IZZY Publishing Pvt. Ltd. WG™ and IZZY Publishing Pvt. Ltd. cannot be held responsible for any inaccuracies or errors and do not accept responsibility for the advertising content. All contents are strictly copyright and all rights are reserved. Production in whole or part is prohibited without prior permission from IZZY Publishing Pvt. Ltd. ©2019 WG™ All rights reserved. Conducted annually, the Independent Publisher Book Awards honor the year’s best independently published titles from around the world. COFFEE ABSOLUTE GASTRONOMY WITH THE WORLD’S CUTTING EDGE CHEFS is the 2019 WINNER OF THE INDEPENDENT PUBLISHERS WORLD BOOK AWARDS. Coffee Absolute Gastronomy is a culinary homage to coffee with 39 of the world’s cutting edge chefs and one sommelier. For the first time a book from the Middle East has won this award. 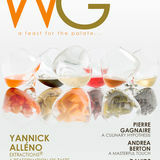 This April issue of WG is a special one, an issue with the leading women in the culinary world. From a self-taught women - Anne-Sophie Pic to the 2017 World’s Best Female Chef Ana Roš to the Elena Arzak, Luisa Valazza. It’s a harmony of art, craft and science with the 2015 Veuve Clicquot Asia’s Best Female Chef Vicky Lau whiles Jean Winter graces the cover of this WG issue. Marzia Varvaglione brings four generations of the Varvaglione family winery and Silvia Baracchi with her Tuscan cuisine. Anne-Sophie Pic’s story is a remarkable one. First of all, it is the story of a family of chefs that have, for several generations now, marked the history of the French culinary arts. It all began with Sophie, the great-grandmother, who opened a restaurant called L’Auberge du Pin on Saint-Péray Road. Very soon, her reputation went beyond the borders of the Ardèche region and gourmets came from all over to taste her poultry fricassee, gratins and sautéed rabbit. Her son André succeeded her, earning three stars from the Michelin Guide in 1934. In 1936, he moved to a new location on national motorway 7, where Maison Pic still stands today. His son Jacques took over from him in 1956, introducing an eight course tasting menu, to become one of the first chefs in the nouvelle cuisine movement to expand upon the traditional three course meal and earning three stars in his turn and offering a cuisine that was revolutionary in both its combinations of flavours and its aesthetics. It’s also the story of a young girl who did not at first seemed destined for a culinary career, since she went to business school (ISG in Paris), with the goal of working in the luxury industry. Until the day, that is, when she realized that her calling was to stay by her father’s side to learn to cook, and to develop the brand that is also her family name. But her apprenticeship was brutally interrupted by the death of her father, who was naturally succeeded by his son Alain. It would be a few more years before Anne-Sophie found the courage to enter the kitchen in which she now has her natural place. In 2007, Anne-Sophie became the only French woman to have three Michelin stars and later in 2011, Anne-Sophie was named World’s Best Female Chef. WG speaks with Anne-Sophie Pic… It’s interesting to learn how chefs find their passion for cooking and where they grew up. How did you find your way into the culinary field to become one of the most sought-after chefs in the world! Indeed, each story is unique; I arrived in the kitchen after a few detours. I am the daughter and the granddaughter of cooks and lived my childhood above the kitchen of my father. My first approach to the kitchen was olfactory. My room is filled with smells of fragrances, perfumes and enticing smells. However, I did not intend to take its suite. I wanted to go to a business school, to work in the luxury industry and defend the French know-how in this sector. When I obtained my diploma, I realized that my life was in the kitchen, it took me away only to return. I was self-taught when I pushed the door of the kitchen almost 25 years and I got great help from my intuition and my memory to invent and build my culinary dream which is made of flavors, the search for complexity and aromatic power, and delicacy of expression. Taking you back when you did your apprenticeship with one of the great chefs of France - your father “Jacques PIC” – tell us about your experience and how did this help you as a chef today… Unfortunately, my father did not really have time to teach me to cook. He passed away suddenly two months after I joined him in the kitchen. However, it gave me values and philosophies of life that make me who I am today and will always carry me forward. My father was very discreet and very hard working. He taught me humility and the passion to work. In this business, every service is a new adventure, nothing is ever acquired. Striving for excellence requires constant commitment, a requirement of every moment. He also taught me the meaning of giving, sharing and transferring knowledge. For me, cooking is trying to awaken the emotions of your guest, for them to view your world; this is a very strong act. And then, of course, my father gave me his love of cooking and his passion for taste. The meal was a unique moment of sharing, pleasure, conviviality during which he commented on everything he ate. You know, somehow, there was a form of learning by capillarity, by immersion. I have very present memories of gestures – of my father’s hands cutting a piece of meat, for example - conversations, taste sensations linked to the discovery of food, brief moments of life that we shared and which constitute my heritage. Your creative approach which is unique… My creative process starts with many meetings and encounters. Meeting with the products first. I am fortunate to live in a region of great wealthy wine, agricultural and ranching. I cook many local products such as truffles, herbs, and chocolate, to name a few. Meeting with mostly men who are behind the products, there are homes of women who love their land and who are working to preserve and enhance it. And I have the chance, as chef, to have access to these exciting and passionate producers who have a thorough knowledge of their products. na Roš is extremely cosmopolitan. Understandable, considering that the top Slovenian chef was allowed to travel the world from an early age and, thanks to her degree in diplomatic studies, has even learned five languages. But rather than becoming a diplomat, Ana opted for a career in the kitchen. At her Hiša Franko restaurant in an Alpine valley close to the Italian border, she combines all her impressions into a cuisine that is local and traditional, yet international and avant-garde at the same time. At the age of seven, there was nothing to suggest that Ana had a glittering career as a chef before her. She was a promising young athlete, who even made it onto Yugoslavia’s national ski team. But at the age of 18, she ended her skiing career to study diplomatic science in Italy. Her aim: a career as a diplomat. But things turned out differently. Because, after graduating, she met her future husband Valter. At the time, Valter’s father owned the Hiša Franko restaurant, not far from the Italian border. Just as Ana was about to start a job in the European Commission, Valter’s father gave up the restaurant and Valter decided to take over the reins at Hiša Franko. But the task would have been too big for Valter alone, so Ana had to make a decision. “I said: OK, I accept the challenge, let’s give it a go!” Ana explains. In the beginning, they both worked as waiters in the restaurant and travelled a lot to find out more about good food and culinary delights. But when staff gradually began to leave the restaurant, they realized that something had to change. As Valter was a renowned sommelier, it was up to Ana to take over management of the kitchen. Although she had no chef’s qualifications, she did have the necessary talent – thanks to her mother and grandmother, who were both excellent cooks. “My mother’s cooking was always very sophisticated, very tasty and very healthy. And she only used local ingredients.” Ana and Valter went on more trips to eat in the world’s finest restaurants, find inspiration and develop their own culinary principles. “I knew the right direction to take – to concentrate on local and seasonal food – but the problem was that my hands didn’t always obey my brain. I lacked some of the necessary techniques”, says Ana. She therefore set out to learn the technical side from scratch – among others, with the help of a chef who taught at a catering school. “Ana’s approach to the kitchen today is technical, almost scientific, but it still allows the ingredients to develop or preserve the original strong taste” Anyone trying one of Ana’s dishes today would never imagine that she’s ever done anything else but cook. With perfect technique, Ana manages to combine different, contrasting flavors and textures into dishes that are so delicious they stay in the memory for ages. Her decision to work mainly with local ingredients (lamb from neighboring mountains, goat kids, game, local pasture beef, even bear, wild herbs and flowers, fantastic milk products, trout, honey and wild fruits) is based on the natural ethos of Hiša Franko. But also because she believe that a guest who travels 500 or even 1000 kilometers to eat her food should experience her food as an ambassador for the local area, people and culture. For her, using local ingredients also means supporting local producers. Her approach to the kitchen today is technical, almost scientific, but it still allows the ingredients to develop or preserve the original strong taste. ‘Raw’ is her favorite. The element of surprise is essential for her – alternating textures (cold/warm, soft/hard) or some taste contrast (bitter/sour; sweet/salty). “We have a herb and vegetable garden at the back of the house from which we harvest our all-important herbs and spices.” The former diplomacy student Ana Roš has brought back lots of inspiration and ideas from her travels. These find their way into her seasonal and locally oriented dishes to create a cuisine that is best described as worldly local. Or, as we like to say: absolutely delicious! WG catches up with Ana Roš, the 2017 World’s Best Female Chef… Being awarded the 2017 World’s Best Female Chef, what does it mean to you? It means a lot. I am self-taught and come from a small country that not many people know has a quite a nice culinary tradition. The difference between a male and a female chef… I do not think it helps a lot to the emancipation of women in the kitchen if we emphasize too much the difference in gender. The truth is, a woman needs to prove she is as good and skilled in the kitchen as men are. Because at the end of the evening we are all equal in front of the client. But there is a difference. It has nothing to do with the taste or techniques. It is all about a role of a woman as a mother, as a wife as someone more sensitive with less muscle. How many times did I cry because my plane was leaving at 8 in the morning and my daughter came to my bed sick with high fever - just because I was leaving again. And kitchen homework’s, kitchen sleeps, guests babysitting my children... Or, finally, when your partner asks you when was the last time I saw a hairdresser? The most sensitive cuisine I ever tasted in my life was from a male chef. I think we manage people in pretty different way. Also, women always tend to create a family feeling. It still happens that people do not believe I can shout. But when I do shout, they really understand I actually can. Your philosophy and how would you describe the food at Hiša Franko? The main idea is to keep the tradition alive at Hiša Franko. Our dishes are closely connected to Slovenian terroir and what our ancestors used to make. Being aware of these two things - and continuously exploring them-is the basis that I create from and use modern techniques in that process. I am supported by beautiful nature that surrounds me and people that take care of it. There are young foragers, cheese makers at 2000 m altitude, winemakers and river & sea fishermen that are my local community. They produce things organically, as the nature is very much unspoiled and just pure beautiful. We don’t have any big industries around us but are surrounded by mountains in the North and the Adriatic-Mediterranean Sea in the South. I think this is one of the things that really inspire my cuisine and me. More so because the living conditions are sometimes quite harsh and the nature can at moments be quite modest in giving. It can feel a bit remote sometimes. I know the quality of all this and this thought always gives me a push when I need it. What’s next for Ana Roš? I am an ambitious person, I always find another motive, goal to reach. I live in a pretty unknown part of the world and there is so much to be done, also in terms of gastronomy. Hiša Franko is trying to develop a unique way of how the countryside restaurant should look like. There is no Michelin guide in our country, which gives us a slightly bigger freedom of expression. The results are fascinating, but it is still work in progress. I am constantly exploring new ways of integrating Slovenia’s terroir into my cuisine. That’s how I communicate with the world. And I also feel this is how my country communicates with the world. That’s what this job’s about! Discovering her culinary vocation at an early age and insisting that she wanted to follow in the footsteps of her parents. Elena Arzak is a product of both inherited and nurtured talent, Elena Arzak was born into gastronomic royalty. Alongside her father, Juan Mari Arzak, she is joint head chef of three Michelin starred restaurant Arzak, a must for any dedicated food pilgrim and lover of Basque culture. We meet with the mother of two who was named best Female Chef in the World in 2012, to discuss inspiration, simplicity and why she doesn’t see herself as a role model. She travelled around Europe learning the restaurant trade and then went on to study at the Schweizerische Hotelfachschule in Lucerne, doing her practical work experience at the International Hotel in Zurich and the Grand National Hotel in Lucerne. She worked in some of the most prestigious kitchen which included Le Gavroche, Troisgros, Carré des Feuillants and Vivarois. She then continued with brief stay at Restaurant Louis XV, Antica Osteria di Ponte Cassineta di Lugano, elBulli and Pierre Gagnaire in París. Food is in your DNA, did you ever think of doing anything else? It’s the first thing I wanted to try. If it wasn’t the right thing or it didn’t work out then fine but you need to try the first thing you want to do. I was 90% sure but if I were not a chef, it would be something related to gastronomy because I like gastronomy. What is your earliest culinary memory? In my family we had a great sensibility when it came to food. My aunt and my grandmother lived with us and every Saturday morning they would cook rice pudding with cinnamon. When I would wake up and go to the kitchen I was greeted by the aroma. A second memory, and I was very small, maybe four or five and I still remember when I entered the restaurant, there were always crabs boiling so I can recognise that smell of fresh crabs. Are you seeing that in your kitchen as well? Do you consciously or subconsciously try to give more women a chance? The Basque society has always been a matriarchal society where women has been very strong. When my father was a child, he and the wine steward were the only men in the restaurant. In the kitchen in was all women and the service staff were all women. So I grew up without being conscious of if I was a man or a woman but people started asking me about it. I don’t care if you’re a man or a woman, I want talent. You’ve been quoted as saying that your food is becoming simpler? Is that true and if so, why? It’s simple like all the tendencies of the moment. It’s an apparent simplicity. It looks simple but it’s not simple at all. What we want to try to do is to give more flavours to the elements of the plate. It looks simple but it’s not simple. Ingredients, creativity or technique? For me the first is the ingredients because without the ingredients we can’t do the next steps. Then creativity and technique. The technique helps you to do things that you otherwise couldn’t do. You can’t do a string of caramel if you don’t have the technique. But if you don’t use good sugar it’s not worth it. The favour for me I the most important thing. What keeps you inspired? Anything. When you like creativity and you like your job. Everything that you see is inspiring. I’m looking at the bottle over there and I see two shells. A shell of chocolate and outside another flavour. Or a crispy galette of squid ink and outside I could do saffron. One thing gives you the other. The other day my son Matteo who is 11 asked me ‘Why don’t you make a dish based on pixels?’ So now I’m creating something based on small squares. Anything can influence you. Would you want your children to follow in your footsteps? I them to choose their careers freely just like I did. No one forced me. It wouldn’t be fair and it wouldn’t work. My sister is an art historian. You can force someone into this career. It would be a disaster. But if they wanted to, I would be very happy. What does it mean to you to have so many people admire you and your father and the legacy that you’ve created? In Spain family is very important. For me, being with my father I started very young and he believed in me. For me, seeing everything he has done is very nice but it’s also very interesting to see the enthusiasm that he never loses. He talks about projects from this year to 40 years from now. He’s fantastic. He inspires me. And still today, even though he comes less, I like that he still comes with me to the restaurant. ueen of “the sacred temple” of International culinary, one of the renowned actresses of that world, Luisa’s food is the reflection of a true woman who loves the gastronomic tradition of her territory, and offers creative and hearty dishes, where technique and research are coupled with devotion. The basis of her philosophy revolves around the choice of local ingredients, culinary customs, finding new forms and variations, so giving value to their peculiarity and offering her magic recipes a great multisensorial feel. Today, Luisa is one of the few female chefs in the world to achieve three-Michelin-star and is recognised as Italy’s leading female chef. Initially, she had wanted to study Italian literature at university and become a teacher, just like her parents. However, Chef Luisa’s career perception took a detour towards the kitchen when she met her husband, Angelo Valazza, owner of the international acclaimed restaurant Al Sorriso. Luisa was self-taught in the kitchen, adapting Italian and French recipes from cookbooks and her natural talent soon became apparent when she started creating her very own Italian gourmet cuisine – based on the finest, local Piedmontese ingredients. Established in 1981, the idea of Angelo and Luisa Valazza a self-made cook and native of Soriso. The secret of their success is attributable to a great deal of sacrifice, authentic passion for table excellence, and the inborn flair for taste which characterizes natives of the Piedmont region. Today, thirty years on, this venue an oasis of harmony and hospitality, a charming concentration of feelings that makes you feel in tune with the universe. With Luisaâ&#x20AC;&#x2122;s creativity and excellent culinary skills, Al Sorriso offers the opportunity to consider cuisine from a different perspective, rediscovering its different tones, combining seasonal herbs and foods and enhancing the local products. The result is a traditional yet well-researched cuisine. In the warm and receptive atmosphere of the restaurant environment, is a perfect harmony between food and stay, guests can afford to be carried away by the very innovative and fantastic feel and pleasure offered by Angelo and Luisa without the loss of oneâ&#x20AC;&#x2122;s personal identity. Beginning from the land, whose value is the combination of local customs, gastronomical tradition as well as research into the products of the territory, you are literally charmed by the blend of tastes and scents, where Luisa skillfully adapts her recipes to the present needs, in a way as to make you taste, the best way possible, all the elements that make up a dish. A true philosophy about taste, it’s a about scents that usher you into the pleasure of food, where the intensity of natural tastes gives real life to Luisa’s dishes, so charming the sight of it and giving great satisfaction to your palate. It’s about transforming raw materials, without necessarily altering their properties, neither their organoleptic quality nor their original taste, which Luisa and Angelo scrupulously select or grow by themselves, in which case, respecting the alteration of the seasons. The cooking is always by gradual heating process. “Luisa’s coking is all about one thing: a life given to researching innovative tastes, all in strict respect of our traditional values, characterized by a simplicity that comes right from the heart” Today, thirty years on, the Michelin stars and lots of other international acknowledgments make Al Sorriso a real oasis of harmony and cordialness, a charming concentration of great feelings - a dreamland. Vicky Lau grew up living with her grandfather, a foodie from the Chiu Chow province where most of the meals were cooked at home which were based on traditional Chiu Chow cuisine with a mix of Cantonese. She often heard stories about how dishes were made and the differences with vegetable varieties. On weekends, with her parents they would go out for meals and very often it would be Japanese food as it was her mum’s favorite cuisine. She never learnt how to cook until high school as she had to cook for herself whiles in boarding school in the US. With dining hall food being the only source of meals, very often foreign students would crave for home-cooked food. On weekends she would gather in friends’ dorm rooms and cook up a storm with a mini electric stove and a rice cooker. The dishes mainly consisted of steamed rice with curry and we’d get very creative with our bowls of ramen noodle. After graduating from the New York University in 2004, she worked in a local advertising agency for a couple of years, upon her return to Hong Kong in 2007, she set up her own design company. As a designer, she always felt that there was something missing but that gap was filled when she went with two friends to do a basic course at Le Cordon Bleu in Bangkok in 2010, finishing the course, Vicky wanted to do more and enrolled for the grand diploma. A recreational stint at the Le Cordon Bleu Bangkok taught her that food, as a medium of expression, was a far more liberating canvas to explore creativity because of the added dimensions of taste and smell. It was also the instant gratification of seeing someone enjoy your food. The curriculum at Le Cordon Bleu was very extensive. Since she was enrolled in the Grand Diplôme program, it was rigorous but rewarding and learning cuisine and pastry in a short nine months. She learnt techniques from the chefs, but also shared stories from their kitchen experiences and to explore the use of local ingredients, which taught her to use whatever is available. Believing that Hong Kong is a place for opportunity and entrepreneurship; and driven by her love for creative work, Vicky set out to make a home for her passion. In 2012, she opened Tate Dining Room & Bar serving French-inspired dishes with Asian influences. Her talent for visual artistry reflected in the immaculate presentation, while her innate creativity and appreciation for gourmet cuisine is evident in the seasonal tasting menu. Inspired to create ‘Edible Stories’, each of Vicky’s menus originates from a common theme and consist of elaborately designed dishes that stir the imagination with their rich imagery and intriguing play on flavors and textures. Using her background in graphic design, she starts with a theme, a narrative or a concept and builds on it. Her ‘Edible Stories’ where each ingredient has its own character and each dish conveying an overarching theme which then transforms into a harmony of flavor, aromas and textures. For Vicky cooking is a harmony of art, craft and science. She is always driven by her passion to tell a story therefore the dish that best defines her is one that incorporates all these factors… One of the earliest dishes she created was “Zen Garden” which she earlier served as the last course of the meal. It consisted of several items and they are changed from time to time. Presented with matcha opera cake, passion fruit marshmallow, jasmine macaroon and coconut dark chocolate. It’s presented as a mini Zen garden that prompts self-reflection. This dish pays tribute to the masters of the Zen garden and the art of tea making. Another of her earlier dishes would be “An Ode to Tomatoes”, inspired by a poem by Pablo Neruda. It details a busy market scene and describes the life of the humble tomato. In this dish she depicts tomatoes in different textures of panna cotta, confit, crisp, consommé and gelée, accompanied with a simple pommery mustard ice cream, a perfect pair for this fruit. Creativity and Technique are both important to her, she ensures continuous growth of creativity and refine in her cooking skills, usually she use all the elements and considers flavor profiles, contrasting textures and always questioning her methods of execution. “It’s also important not to burn out and lose your passion and desire to cook. You may be cooking the same vegetable, but you need to look at it in a different way every now and then” adds Vicky Lau. hospitality team. Lau was commissioned by several renowned lifestyle and fashion brands to develop highly customized one-off menus and tablescapes. Butler has previously prepared culinary extravaganzas for Hermés, Cartier, Gucci, Boucheron and Christies to name a few. In 2015, Vicky Lau was awarded Veuve Clicquot Asia’s Best Female Chef 2015. Named as the best female chef in Asia for creating a menu of ‘edible stories’, rewarded as one of the globe’s most influential female chefs. It was an honor for her to receive this award, since raised in Hong Kong and educated in the West, Vicky Lau feels her work is infused with a variety of culinary influences. The award was an invitation to more opportunities, being recognized which inspired her to explore more projects and collaborations in the future. ean’s relationship with food has always been one of a love-hate relationship. She loves food and hates it if she can’t eat what she loves. Whilst growing up, food was all about love, community and friends. Family gatherings or dinner parties with friends were never without good, proper, home cooked dishes by her mum. Her friends would even call up her mum and arrange a dinner with her at her house without her knowing until much later. Her family pretty much saw food as a celebration of life, love and family. Like any other daughter whilst growing up, Jean helped her mother in the kitchen prepping vegetables, peeling prawns or pounding spices with the mortar and pestle. Food preparation for her was fun and engaging even as a kid, to be surrounded by the smells, colors and textures of the ingredients, spices, vegetables and meats. She learnt not to be afraid of handling fish and meats yet learnt how to chop, cut and prepare them with love. This is something she hopes to pass on to her little daughters. A typical Singaporean and a very proud mum of two beautiful girls - Tegan 9 and Keira 12; a wife to an amazing husband and father, Andrew. A college lecturer turned business consultant turned owner of a catering/events company in the UAE. It all began when she got married, moving out of her parents’ home meant that her mum was no longer around to cook. Both Jean and Andrew would arrive home after work to the smells of potpourri as opposed to the smells of her mother’s dishes. At that time, she was still lecturing history in college and was the teacher in charge of the college track and field team. Training sessions ended late and the team and she would all end up eating at the nearest hawker center before going home. If there was no training sessions, Andrew would get back from work at about the same time as she did and it would either be a takeaway or a walk to a restaurant or eatery. If she cooked, it would be during the weekends. That was when she renewed her love for cooking. She tried out new recipes and explored new grounds when it came to trying out dishes from all the various cuisines. Her cooking skills were not spectacular then with a few hits and many misses. Andrew was encouraging and never seemed to think that any of her dishes were inedible. Andrew got posted to Italy, Jean was seven months pregnant, and the first month was tough, very tough, in a foreign country. Moving from a fully functional country to Italy, the country of laid back beautiful people who either believes that rules are meant to be broken or they create new rules as they go along. Her consolation in that first month was discovering Focaccia and all the other mouthwatering dishes. She discovered the flavors of simple, down to earth Italian cuisine that is cooked with love, from the street vendors to the small run down trattorias down the street. Surrounded with fresh ingredients from the local farmers markets, Jean learnt the intricacies of Italian cooking from her dear friends in Genoa. It all started with cooking for 4 then 8 then 12 then 20 people at their house that overlooked the Liguria coast. This made her realize that she loved food, not just eating it but also the entire process from choosing the ingredients, prepping, cooking and presenting the end product to her friends and loved ones. It helped that everyone genuinely seemed to love whatever she cooked judging from the empty dishes. Where they lived in Geneva the food was dismal, she was depressed for the first few months not being able to find a good eatery at reasonable prices. Jean adds “It was either eating at Michelin Star restaurants where you paid through your nose for a 3 course meal that had minute portions or tasting greasy, tasteless, MSG-filled dishes from restaurants claiming to specialize in Thai-Vietnamese-Chinese- Indian cuisines at one go. I often left dinner pissed off, ‘hungry’ or at least €250 poorer. There were not many takeaway options which meant that when we were carrying out house renovations past 7.30 pm. we either had to eat at crappy restaurants that Andrew knew would end up with me in a filthy mood after or entering a Michelin star restaurant in our dirty work clothes and be frowned upon by fellow diners, which obviously happened”. It was during one of those night out that she told Andrew “I cook better than any of those restaurants and if we are looking for takeaways so will many others”, she figured that there must be a demand for takeaways and if she was confident that her home cooked meal tasted a ton better than the surrounding restaurants, she could offer her meals at a cheaper price. Her crazy idea might just work. Andrew knew that once she has an idea in her head, nothing would stop her. It was the start to Jean’s Private Kitchen. Jean started Jean’s Private Kitchen as Geneva’s first underground dining concept in her home, catering to mostly clients from UN, WHO, WTO and football players and VIP’s in the Geneva area. Jean relied purely on word of mouth with no advertising whatsoever and only people who knew someone who knew her could book her. It all started speaking to seven friends in Geneva and in two and half years she built a clientele base of over 700 private clients in Geneva. The business then grew to France, Hamburg, Singapore and now to Dubai. Jean adds “Funny thing is till today, only the people who know me knows what I do and that I exist. It keeps it fun that way and because I see my job pretty much as a passion as opposed to a career I get the luxury to choose my clients, who I work with and which projects to work with”. Known for her Singaporean home style dishes especially for her Peranakan dishes using recipes that have been passed down through generations. Nothing fancy but comfort food at its best. That is why she still can’t believe how she got to where she is today cooking for famous people and VIP’s, just cooking dishes she grew up with, her food is about love, dishes taught to her by her parents and family. “I still giggle about the day I had guests fly down from London to Geneva for a dinner at my home then back again on their private jet and they made a booking then for their next dinner which was three months later”. Jean’s culinary philosophies are simple: “She will not feed her guests or clients what she would not feed her own family. Her dishes aim to recreate the same sense of comfort and happiness that one’s favorite childhood dish evokes. If she gets a satisfied smile or the little happy food dance from her guests, she is one happy woman. And lastly, her mum’s cooking is the best which is an undisputed fact, so she sticks to feeding her guest’s comfort foods with a healthy twist and making the dish as colorful and pretty as possible. For each dinner service, Jean creates a new menu, she has never repeated a menu because every set of dinner guests are different. She tries to find out a little about each of her guests before and will try and create a dish that would take them down memory lane or create something similar to their favorite dish. She love to surprise her guests with a hint of the flavors they love the most when they least expect it. Her travels around the world have inspired her a lot, she is blessed to have had the chance to travel the world and with each country she visits she tries to learn about the food, culture. Street food in every country reveals the most about the food culture of the country and she tries to take these reflections back with her when she plans her menus by trying out new spices she brings home from her travels. Her culinary inspiration never runs out. Jean loves what she does, passionate about it and it counts as a hobby and not work per se. The driving force is her passion and the luxury of choosing when she wants to work, who she wants as her clients, where she wants to work in terms of turning down jobs in locations that does not interest her and how she wants each event to turn out. fter her Masters in International Management, Marzia Varvaglione joined the company and started to take care of the expansion into new markets. A full immersion experience in sales turned her into a business developer. She was looking not only for new markets, but every single opportunity to brand the company. She tries to look beyond, and imagines Varvaglione in 10 years. And wants the company to become a reference point for the sector, reinforcing the Varvaglione image as the Family of Primitivo. Marzia’s greatest achievement is brand recognition, “It’s much stronger than when I arrived, and changing the name to Varvaglione 1921 was key. Also bringing a creative touch to the labels, making them attractive for a vaster audience” says Marzia. Her family’s passion and love for their land, for four generations of the Varvaglione family winery… A story told over time, years and generations. The Varvaglione story began with Marzia’s grandparents (Grandpa Angelo and Grandma Filomena) and their special love story. 1921 was the first harvest, and the fruits of their labor were sold for the first time under the family name. It was a time of experiments, passion, and the challenge of producing wines that expressed the unique and distinctive flavors of their beloved Puglia. Believing in the land and working it with respect, with an eye on preservation for future generations: this is the philosophy that has guided the Varvaglione family in all its choices, since 1921. “Our wines come from this land: Puglia is a territory of green countryside as far as the eye can see, that is, to the horizon and the Ionian Sea. Flavors of the south, almonds and vineyards, a mild climate, vibrant colors, the austere architecture of the masseria farmhouses: this is what makes our land so special, a land we have been faithful to for four generations. We grow native grape varieties; in every bottle we produce there is some of the sea breeze and fertile land of Puglia. Our position here just got stronger, with the acquisition of the masseria where our grandparents made their wine. From the terrace, we can admire the expanse of vineyards where it all began. Our goal has always been that of not just ‘making wine’, but allowing the grapes to express the best of this territory. It is our land and not the producer who makes Varvaglione’s wines”. Four labels, four wines & four different characters The Houndstooth, with its legendary elegance it dresses the sharp and light taste of Primitivo. Tweed is a synonym of comfort and innovation to dress the delicate taste of 12 e mezzo Negroamaro, appreciated by young palates. Polka dots, more romantic, is perfect for the aromatic Malvasia that tells about the liveliness of the young; and then, the classic pinstripe dresses the fine taste of rosé with a clear and linear texture perfect to enclose the small ironic bubbles of this wine. “All over the world, Italy is connected to one only great adjective. “Beautiful”. This is why we really care about preserving the magnificence bound to this statement. May it be wine, design or whatever about our wonderful country? The only thing left is being charmed by these wines, while choosing the one that represents you better. Stay Fashion!” says Marzia. The vine varieties of Varvaglione 1921… The native grape varieties of Puglia range from the white Fiano to the red Negroamaro; in the hands of Varvaglione 1921 they become quality wines. But Puglia is above all the home to Primitivo, which finds its best expression in Papale Oro: a modern interpretation of a tradition dating back thousands of years. Papale Oro is the flagship wine of Varvaglione 1921, and the winery’s finest expression of that quintessential Puglia native grape variety, Primitivo di Manduria Grown in the Papale contrada in the region of Manduria where the Primitivo DOC is grown, the two Papale labels differ for the age of the grapevines. Papale Oro is produced from vines that are from 40 to 80 years old, while Papale Rosso is the product of vines dating back to 20 to 35 years. Varvaglione began making Primitivo forever, among the cellar’s collections, there are a good 11 wines made from this prolific, native Puglia grape variety. But Papale Oro is the winery’s iconic wine, in 2011, it was introduced into the market with the 2008 vintage on the occasion of the cellar’s 90th anniversary. As its name is implies, Papale is linked to the papacy and a Pope from Puglia – Pierfrancesco Orsini (1649-1730), elected as Pape Benedict XIII in 1724. He used this very same lot of land to make his own Primitivo wine. Today the Primitivo labels reproduce a document dating hundreds of years that tells the story of the election of Pope Benedict and the jubilant response in Puglia. The rejoicing was great on the part of the citizenry for the ascent to the Papal throne of their Lord, now the Highest Pontiff, that for ten days and nights they displayed extraordinary delight, many were the resounding pearls of firecrackers, rounds fired from harquebus, and every sort of firework. Giving public thanks to God with a solemn Te Deum, for having chosen to govern his flock with such a Holy and Zealous Pastor. The rejoicing was great again in 2013, when Varvaglione 1921 received a special and mysterious order for 115 bottles of Papale. The ship was Rome, more specifically, for Vactican City. Indeed, the odd number of bottles ordered corresponds directly to the number of Cardinals in the College that was electing the new Pope. Is it any wonder that Papale Oro is the symbol of the Varvaglione family winery? Growing up in a small country town called Bunbury in Western Australia, Teresa learned to love food when she was about four years old. She would watch her great aunt churn out babka (pound cake) and sernik (cheesecake) for their Polish family and friends and Teresa would help out in the kitchen – her great aunt would get her to sift the flour, prepare all the ingredients and shape piroshki (big ravioli) with her tiny fingers. Everything was made from scratch and was both simple and nourishing. That was the beginning of Teresa’s love of cooking. Her aunt and uncle were her biggest inspirations when she was young as they were right into wholefoods and creating dishes that were straight from their garden and purely delicious. Her great uncle would re-use a tea bag several times before he threw it out. The day-old rye bread in the pantry was used to make a rye porridge for breakfast and it was as simple as breaking up chunks of bread into a bowl and pouring steaming hot milk and coffee over it. It tasted amazing! She still gets inspired by their simplicity. A few ingredients can become something spectacular. At the age of fourteen, she got a part time weekend job at the local bakery. She was inspired by the bakers and all the wonderful creations that came out of the oven. After leaving school, she trained as a chef for many years and worked under many great chefs in Perth. “I got to know how to combine food and the importance of taste, seasonality and freshness when creating a recipe”. She gained an apprenticeship with executive chef Neal Jackson in his five star kitchen, and spent the next few years slaving over the proverbial stove – creating hot and cold entrees, main courses, desserts and cooking rich, French-style sauces and pastries. She was soon promoted to assistant pastry chef in the hotel kitchen and went on to win a gold medal at Salon Cullinaire for her creation of a magnificent Indonesian layer cake (German Tree Cake) that resembled pages in a book and decorated with chocolate fondant and marzipan to resemble an ancient-style biblical masterpiece. Six years after qualifying as a chef, she started her own catering business. Teresa is also qualified as a personal trainer and studied nutrition at Deakin University which in turn helped her to develop simple healthy recipes that were purely delicious. A fanatical kickboxer, Teresa came second in Australia for fitness figure (body sculpting), “it is magnificent how the food you eat and exercise you do can transform your health as well as the way you look” adds Teresa. In 2006, she opened her first café in Sydney, Australia named ‘The Healthy Chef’. She wanted the café to emulate the feeling she experienced in her great aunt’s home. It was one of the first cafés in Sydney to offer healthy, plant-based, delicious food and appeal to the masses. Working crazy hours and suffering from adrenal burnout and exhaustion, she knew if she didn’t do something about her health she was not going to be around for too much longer. She sold the café in 2012 and got her health back on track and decided to use her knowledge, experience and passion for healthy food to create a range of nutrition products made from clean, organic and honest ingredients as well as a collection of cookbooks to help her own health as well as others on their wellness journey. As a regular columnist with the prestigious TIME magazine (USA) and the author of several international award winning cookbooks, Teresa is the founding director of The Healthy Chef Functional Food Range that consists of organically sourced proteins, superfoods, teas and nutritional based wholefood products. The Healthy Chef is also a boutique media and publishing company producing quality healthy cookbooks for the Australian and worldwide market. Her goal is to get people cooking and eating healthier! easy, which is why I wrote my cookbook Purely Delicious. I wanted to show people that healthy cooking can be so simple and good for you. When I was doing my training as a chef, Nouvelle Cuisine was at its prime. We focused on fresh, seasonal produce, cooked simply and plated immaculately. I recall one night as a second-year apprentice. I was assisting the French spoken sous chef with hot entrée and main course plating. I recall putting a prawn tail on the plate, in the wrong position and was welcomed by a tantrum and MERDE….you FU$##@ IT UP! And sheer frustration….. I never got that wrong again. I worked 16 – 18 hour days and was married to my work, using every opportunity to learn from the other chefs and experiment. I became fed up with the complexity of many of the dishes and just craved the basic goodness that was in food naturally. Today that’s how we approach our product development at The Healthy Chef for our range of functional foods such as protein and superfood blends – made from simple, wholefood ingredients that are designed to improve your health and wellbeing. Less is more and quality and taste of the ingredients are the main focus. I remember when I was designing my drinking chocolate….I sourced both raw cacao powder and rich dark cocoa powders from around the globe. Each one had its own characteristic and flavor profile, some were rich and sophisticated, others were light and fragrant…. in the end I settled on two types both a dark European style Dutch cocoa that was for a mature palate which I combined with Madagascan vanilla as well as the lighter raw cacao version that I blended with roasted carob and Tahitian vanilla to bring out the floral aromatics. “My recipes are designed for people who don’t have a lot of time to spend in the kitchen, but are looking for meals that are healthy with a little indulgence” Take us through the foundation of healthy cooking… It’s really not as complicated as it’s made out to be. Just keep it simple - a few simple ingredients can become something spectacular. My recipes are mostly plant-based, simple, achievable, quick to make and they all work because they are tested time and time again in my test kitchen, on my wonderful staff who are also great cooks and on my husband Paul – who tells me honestly like it is….some are devoured…. some go in the bin and I start again. I always try to source fresh organically grown or ethically produced ingredients and I don’t compromise on quality and taste. Your culinary philosophy... My philosophy has always been - keep it simple, keep it fresh and prepare it yourself. My recipes are designed for people who don’t have a lot of time to spend in the kitchen, but are looking for meals that are healthy with a little indulgence. The food isn’t rabbit food – its nourishing food that anyone can create and are deliciously good for you. I’ll be inspired by walking through a farmers market and seeing crisp and leafy bundles of baby cos lettuce that I can drizzle with a vinaigrette made from Dijon mustard, apple cider vinegar and good quality extra virgin olive oil. I top them with delicate bundles of smoked ocean trout, capers and fine slices of red onion. I may see some gorgeous baby heirloom carrots that I roast in the oven and pile over a bed of citrus scented hummus, pomegranate molasses and pistachio. Produce, Creativity or Technique… Fresh produce and the quality of your ingredients is paramount in any dish. A tomato for example becomes a masterpiece when cut into chunks and drizzled with good quality olive oil then sprinkled with fleur-de-sel. There’s nothing creative or technical about a sliced tomato and olive oil….but it will taste dam good….and even better with a side of buffalo mozzarella. Your greatest influence in the kitchen… My great aunt and uncle’s style of cooking has always been my biggest influence in the kitchen. I still get inspired by their simplicity. My aunt used to use butter in a lot of her baking recipes however as she got older mixing the butter with a wooden spoon became too difficult so she replaced the butter with olive oil. Olive oil has now become a key ingredient in a lot of my baking recipes and it’s so good for your health and wellbeing. What keeps you motivated? I’m motivated by the numerous emails I receive every day via The Healthy Chef website. It’s wonderful helping so many people on their health and culinary journey. I also can’t sit still and I’m just fanatical about cooking…not a day goes by where I’m not in the kitchen. “Healthy Baking” and “Purely Delicious” are all about healthy cooking and a discovery of turning fresh ingredients into purely healthy food... It’s all about going back to basics, keeping things simple and using quality ingredients that are good for health and wellbeing. The recipes in my cookbooks Healthy Baking and Purely Delicious are made from pure, honest wholefoods and are designed for pleasure as well as nourishment for the body and soul. Whether you are sugar free, gluten-free, vegan, paleo or wholefood based – there is something in these books for everyone. AMBASSADRESS OF TUSCAN CUISINE Born in Perugia and raised in the heart of Cortona, Silvia Baracchi proudly declares herself “Etruscan”. From a family of restaurateurs she has inherited passion for good food, the sensitivity to the traditions and the art of hospitality, all-thewhile with the positive energy of Il Falconiere inspiring her culinary style day by day. Boasting of several culinary experiences with chefs from around the world that have allowed her to share the cuisine of Cortona with the world. For many years she worked with the Executive Chef Richard Titi, and shares a profound harmony and a constant evolution. Consistency is the concept that embraces her kitchen. Her Tuscan cuisine is made with great ingredients respecting the tradition, the seasons and with a touch of new presentation. With a lot of exchanging experiences with chefs from all over the world who are enriched with her know-how. Her cooking courses takes the name from a friend Francis Mayes’ book - “Cooking Under The Tuscan Sun”, participants arrive to learn the secrets of Tuscan traditions . Her cookery school has increased the passion for food and provides Tuscan lovers with the skills they need to translate this love into beautiful and imaginative cuisine. Passion is the most important thing for a chef, the beginning and the end, the Alfa and the Omega of our extraordinary work. First of all you must have passion inside yourself. After that there are many components: your heritage, right opportunities, having an open mind and the famous sliding doors! Your cuisine inspired by the territory... My cuisine is deeply immersed in my territory, here I can find the best ingredients and the deepest inspiration. The right balance is our goal and the best way to achieve it, is to follow the season and be able to capture the greatest fragrant flavors and scents. The Tuscan cuisine is itself very rich of definitive aromas, great dishes evergreen, but of course is actually important to balance tradition with contemporary trend. Your previous experience which helped you as a chef today… I grew up in a family who owned a traditional restaurant: good taste for food, passion to cook and a daily wish to share with friends and guests, our family specialties. When you breathe the air, the sounds, the lifestyle of this world, it remains deeply in your soul…..so it was so natural for me to decide to start with a new adventure: my own restaurant, a place to express and share my personal vision and my passion for food... I opened Il Falconiere by transforming my husband’s family Villa in the most glamorous restaurant of the area. Ingredients that inspire you... Iâ&#x20AC;&#x2122;m a food hunter, I like experiencing and understanding. I love to exalt the many extraordinary ingredients of my land: Cortona and its surroundings. The very heart of beautiful Tuscany! There are so many good products coming from local farmers and artisans that I love to use in my kitchen and explain later at the restaurant to my Guests. The true km 0 is where my philosophy begins. I like so much using wild game in season to create extraordinary recipes totally different by the normal scheme, this meat for sure is the most natural and healthy, very tasty and not ordinary. I like the Chianina our local beef, famous all over the world for the high quality, using different cuts and its giblets: liver, tripe, sweetbreads, tongue etc. Vegetables are very important as well, I have my vegetable garden where the freshness of the products makes the difference. Aromatic herbs and spices are also unmissable on my cuisine. Special cooking techniquesâ&#x20AC;Ś I have three restaurants with different menus. In each one I like using a different and personalized cooking style. The technique must follow your recipes and not vice versa. At the Michelin starred restaurant Il Falconiere we use different techniques to make every dish light, healthy but at the same very tasty, we use to marinate some meats and fish, low temperature cooking, steaming or mixing cooking techniques, is often the best solution. My second restaurant is Locanda del Molino: It is a traditional restaurant where we use a wooden oven and a fireplace to cook, important for the traditional Tuscan recipes. At Bottega Baracchi at the end, a sort of fusion bistro, wine bar and contemporary restaurant, we are open to traditional and innovative techniques. What keeps you motivated? Before to do something else is better to be a Chef! Possibility to meet many people, to express your thoughts, travel all around the world to promote and show your cuisine. All this is very exciting and recharging you a lot. native of the southern Brazilian state of Paraná, Manu Buffara has been rising to prominence among a new generation of masters in the contemporary gastronomy scene. At her restaurant, Manu, in Curitiba, dishes delight guests with very Brazilian ingredients. Notable for their excellence and technical sophistication, they are also masterpieces of simplicity and sensitivity. Their modern and fresh aspect does not overawe, on the contrary it provides cozy respite. Manu Buffara’s choice of ingredients is a story a part: grown in her very own garden, coddled by a team of trained gardeners who are treated like part of the family, true artisans in a group that is passionate about nature. And it is they who dictate and mold Manu’s ever-changing menu, with debuts every day in the form of tasting menus. Her respect for ingredients started in her childhood, and they were seasoned in Italy during stages at Michelin starred establishments and gained form and consistency after she became the first Brazilian to intern at then-unknown Noma, in Denmark. Another significant influence, in terms of discipline and perfectionism, came with a stint working for Grant Achatz, of Alinea in Chicago. Inspirations for Manu’s recipes come from a plethora of experiences, including some hard graft on a fishing boat in Alaska and backpacking through Europe, as well as from distant family memories and her current team of masters and small scale rural producers with whom she partners. The research room and laboratory at the restaurant are responsible for gems like new flours and vinegars. So much love and dedication earned Manu Buffara awards such as Revelation Chef, Chef of the Year, Personality of the Year and Contemporary Cuisine in publications such as Guia Quatro Rodas, Veja Curitiba Comer & Beber, Bom Gourmet/ Gazeta do Povo, between 2011 and 2014. In 2015 Manu was also awarded as Best Restaurant of the Country, and Best Restaurant of the South Region by Prazeres da Mesa Magazine. Unforgettable trips only scenery, endless crops today in the inspiration, her dishes. All the respect that Manu has, was inherited from her father, the ideal use of the products, makes your menu a mutant. Always with the objective of maintaining the freshness, its inputs are selected according to the availability of the season. orn in Budapest, Eszter Palágyi travelled around Europe worked at some of the most prestigious kitchens before returning to Budapest and joining Costes - the first restaurant in Hungary to receive a Michelin Star. It was in 2015 when Eszter took over Costes as chef de cuisine and a year later in 2016 Costes Downtown was opened and she was declared Chef of the Year of Hungary and at the same time Costes Downtown was awarded a Michelin star, making her one of the youngest female chefs in Europe to earn a Michelin star. If Eszter goes back to the very beginning, her next memory after her first words and moves was peeling potatoes alongside her dad. “I have learnt to cook from him, he was the hobby cook at home, he was a very good cook actually and many times our family was organising pig slaughtering events. I have learnt from him and from my family everything there is to know about Hungarian flavours and traditions. However cooking was part of our everyday life, this wasn’t my initial choice of career. Finally life took me to this direction and one opportunity offered the next one and basically this is how I climbed my ladder in this profession. I was a rebelling teenager; my parents were struggling to guide and control me. When I was ready to start college, my father told me that he was not willing to finance my studies and my partying lifestyle, so I had to find a job and become self-sufficient. Then with a prompt move I changed school and profession. I turned from a PR marketing little girl into a cook apprentice. I also had the chance to work alongside the school; I started as an apprentice in the Hilton” adds Eszter. “It is not easy to bring about these two on a plate and it is a great challenge to present good, Hungarian ingredients and traditional dishes at fine dining level. I am using the flavours and memories from my childhood combined with the techniques and style I have learnt abroad. Every day is a challenge.” She honed her culinary skills in some of the best kitchens - L’Atelier de Joël Robuchon in London, Mount Falcon in Ireland, and Taubenkobel in Austria. This period was very difficult; this kind of fine dining was very new to her, especially at such high level. She had to work a lot, days were very long, stress and shouting were part of everyday life, alongside the intense pace, continuous concentration, zero tolerance to failure but it was well worth it, she learnt an incredible amount. Both in terms of the human perspective and both in terms of her profession she learnt a lot at these places about discipline, fitting into a team, research and utilisation of raw ingredients found in nature. She learnt to be more creative and experienced how hard work it is to be the chef of such kitchens. Eszter started off as a pastry chef at Costes and then took over the kitchen from Miguel Vieira, the chef who put Hungary on the Michelin map. She maintained the star ever since. â&#x20AC;&#x153;It is extremely important for me personally, because I have been given the opportunity to maintain the reputation of Costes by a very good Chef. I would like to prove myself at all times and to show that I am worthy for this honour, furthermore I would like to make sure that all our customers are satisfied with the restaurant. Costes is open 5 days a week and we serve dinner only. The restaurant is able to accommodate 35 to 40 guests, but we start working already early hours in the morning, to make sure that everything that is served to our guests is as fresh as possible and presents the highest possible quality. Every day we are trying to get the best out of ourselves. We are cooking for our guests and if the Michelin Guide awards this by granting a star or two stars, it will be our greatest pleasure. This is how we get the feedback that it is worth working so hard every single day and it is worth sticking with our philosophy. Every single customer and positive feedback gives us a huge impetus.â&#x20AC;? Her culinary philosophy is traditional: Hungarian flavours and dishes combined with French style and techniques. When she creates a new dish, she always recall her childhood memories when she was cooking with her dad. “I love to represent these flavours and scents in my dishes and raise them up to fine dining level. I am inspired by the current season intertwined with a memory. I always consider my current dish the best, as at the time I am in love with the one I am developing. I never give up, sometimes it is necessary to recognise our own limits and possibilities. For example I love to work with fresh seafood ingredients, but Hungary is not a seaside place, this it would be difficult to procure on a daily basis the fresh seafood goods and of course this is also not very typical of Hungarian gastronomy. I believe that a Chef should create by using the natural amenities of the given country and as a result customers will also be able to identify themselves better with the dish we place in front of them. I truly find it important to present and keep alive the place and typical gastronomy of the country. Without past, culture and heritage there is no future and this also applies to gastronomy. We have to nurse and cherish our own traditions” adds Eszter. Her advice to young chefs… Chefs need to be perseverant, humble and attentive, furthermore they have to have a good load-bearing capacity, keen to learn, team-player, creative and always have to be open to new things. This is not an easy profession; therefore chefs shouldn’t give up along the way. If you really want to do this job, you have to cook with love and this love can be tasted in your food. Your work should be your hobby and your hobby should be your work! Bongkoch “Bee” Satongun has been cooking since the age of five, helping her mother by preparing curry pastes and squeezing coconut milk in the early years and progressing to completing dishes by herself between high school and university in the small family restaurant in Bangkok. However, her rebellious personality led her to see cooking as a chore and she moved on to pursue a career working in hotels in the back-end of the business. The tables turned when, at the age of 28, she met Australian restaurateur and Chef Jason Bailey. Although she already knew the authentic flavors and ingredients of classic Thai dishes, Bailey helped add a more formal element to Satongun’s culinary education by training her in the kitchen. Bee Satongun started her culinary journey researching old family cookbooks and heritage techniques before opening the current incarnation of Paste with Bailey in Bangkok in 2015. The restaurant is airy and modern, recreating the feel of an elegant Thai house with handmade furniture made from paper and bamboo, floor-to-ceiling windows and a sophisticated soft color scheme. Satongun is in charge of the kitchen, while Bailey oversees the operations and art direction of the overall restaurant. The couple’s shared passion for the country’s traditional cuisine and their strong desire to elevate Thai dishes to a higher level led to the creation of Paste’s “heirloom creative Thai cuisine”, with a philosophy of keeping 80% of the traditional dish and innovating 20%. Striving to keep the original flavors in her dishes, the 41-yearold Thai chef expresses her personality by adding new layers of complexity, while refining and smoothing out the flavors and presenting the dishes in innovative ways. With roots in the 6th and 7th centuries, Thai cuisine has changed and evolved over time, absorbing Portuguese, Dutch, French, Japanese, Chinese and Lao influences but in Satongun’s words, “Authenticity is not duplication of the past. It is learning from the past, discovering depth and details that are new to us, and adapting them to the future, just as those artists, writers, and chefs of history did before us.” In her opinion, food is worthless without cultural taste which cannot be reproduced or faked and comes from deep within the chef who must have been fortunate enough to cook with older Thai generations. Paste gained its first Michelin star at the beginning of 2018 and Bee Satongun also became Asia’s Best Female Chef 2018 - awarded by Asia’s 50 Best Restaurants – in recognition of her technical expertise and flair for striking a delicate balance between tradition and innovation, reinterpreting traditional Thai cuisine in a modern context and combining ancient and contemporary techniques alongside surprising twists. At Paste, Satongun and Bailey are dedicated to sourcing the best fresh produce from all over Thailand by going on regular research trips, including handpicked coconuts, mountain salt from the northern region of Nan and fish sauce made from local freshwater river fish with a milder flavor than sea fish. “Thai food is all about the freshness of the ingredients and it’s important that they come from the right area.” Menus change regularly but diners can expect intensely flavored, colorful dishes such as the char-grilled langoustine salad with northern Thai forest ingredients; beef rib, braised for 12 hours and served with long pepper, roasted tomatoes and mushroom soy; old style hot and sour soup of crispy pork leg, chargrilled shallots, jackfruit seeds, roasted tomatoes in a smoky chicken broth; tapioca dumplings of royal project smoked trout, toasted peanuts, mustard leaf and wild sesame or one of Paste’s signature curries, such as Kaeng Bon with live ocean lobster, elephant ear plant from Chachoengsao Province, salted and cured game fish, kaffir lime and mangrove apple flower. It is now important to Satongun to make sure that the recipes and techniques she has rediscovered are passed on. Her daughter Sydney, who is five years old, is already helping with food prep at the restaurant, “but my job now is to teach everything we have learnt in these years to my chefs at Paste, so that they can absorb those flavors and techniques and keep authentic, elevated Thai food alive.” WG catches up with Bee Satongun… Your cuisine, your culinary philosophy… Paste recreates what is seen as extremely old and makes these dishes relevant to diners today by blending a sense of tradition with a contemporary twist. Our dishes are a tribute to local produce, showcasing rare and ingredients and herbs sourced from throughout the country of Thailand. Our success comes from understanding the old ways of traditional Thai cuisine but not being completely bound by these ideas. Our approach is to modernize about 20% and to keep 80% of the original dish’s culture and heritage. Our philosophy is also to showcase local produce, particularly rare and ingredients and herbs sourced from throughout the country of Thailand for their brightness of flavor. To resurrect traditional Thai flavors and revitalize them for contemporary diners. I will go through an extensive process of testing and refining a dish, referring to the original recipes but also questioning how to reinvent it. I try to reflect my creativity in my cuisine, although this may be seen as rebelliousness. At the end of the day, I am dedicated to learning what has created and influenced the amazing landscape of Thai culinary history, from the palaces to the villages. I am dedicated to learning about the amazing landscape of Thai culinary history, from the palaces to the villages. The Snidwongse family cook book (Royal Thai Cuisine) has been a really wonderful resource of knowledge and inspiration for me, it’s through these old cookbooks that I’ve developed a specialized knowledge of Thai cuisine. Food without culture is pointless. Traditional dishes, recipes, techniques and the overall heritage of Thai cuisine must be learnt and respected first and then applied as the foundation. If you approach it from a contemporary standpoint first, the soul of the dish gets lost. Your earliest food memory, flavors from your childhood… Kaeng Bon is one of my favorite dishes at Paste. It’s a particularly elegant and has such a delicate taste, it shows what an excellent curry should be. It is known as one of the most difficult curries to perfect so many restaurants now may not serve it. The dish originates from Jomthong district in Phitsanulok in northern Thailand, this dish dates back over 200 – 300 years. It’s quite unusual to find this as only the older generation is familiar with these refined dishes. I have fond memories of this dish as when I was young, my mother’s friend would cook it for us. She really knew how to capture the balance and harmony of the flavours and I strive to acquire the same skill. There hasn’t been anyone in my experience that cooks this particular curry the way she does. 26 FLAVOURED CONGEE WITH HORSE HAIR CRAB AND GARLIC CHIVE ROOTS. What keeps you motivated? It’s the desire to evolve as a chef and as a person, and to meet with like-minded people. For me, it’s important that we view life and our career as a journey; we shouldn’t be obsess too much about what will happen in the future and stress ourselves about how to attain success. Being a chef is perceived as a glamorous profession, your advice to chefs entering the kitchen for the first time… It’s important to not be influenced only by cook books or one train of thought, or even a chef. Try to integrate yourself into the culture and social environment the food is from, food without culture is worthless. Traditional dishes, recipes, technique and overall heritage of Thai cuisine must be learnt and respected first and then applied as the foundation. If you approach it from a contemporary standpoint first, the soul of the dish gets lost. orn in Denmark, Kamilla Seidler never had any doubts about the future that she wanted for herself, since her childhood she loved cook and followed her dream. She went to culinary school, at Hotel &R estaurantskolen København and later went on to work in some of the best kitchens around the world - Mugaritz in San Sebastian, Le Manoir Aux Quat’Saisons in Oxfordshire and Restaurant Geist in Copenhagen. Kamilla has always been a chef who is distinguished by her professionalism and perfectionism. She started culinary school when she was 21, after having a small design store with her mother after high school. Kamilla was in doubt on what to study and was interested in everything from architecture to law school. One day she was reading the newspaper and saw that the culinary school of Copenhagen was starting classes a couple of months later and she decided to try it out. Probably inspired by Jamie Oliver and other similar cooking shows at that time and she thought it would be nice to at least know a bit more about cooking. She didn’t realize that this would be a life changing decision at that moment. After accepting Claus Meyer´s irresistible invitation to be part of a dream called GUSTU in Bolivia, she arrived in La Paz in 2012 seeking to share her knowledge and experiences with young people and make at least a small difference in their lives. This goal, coupled with a huge commitment to Bolivia and its native products, and a deep respect for the work of hundreds of Bolivian producers, has earned Kamilla the name of “La Danesa de Los Andes” and has led her to represent Bolivia in some of the most important events worldwide: Tambo in Bolivia, Madridfusión in Spain, Parabere Forum in Spain, Qaray-Mistura in Peru, Ñam in Chile, Alimentarte in Colombia, MesaTendencias y G-11 in Brazil, Street Food World Congress in Singapore, From Forest to Table, Sustainable Amazon Gastronomy in Peru and Ecuador, World of Flavors of Culinary Institute of America and Aspen Ideas Festival in the US, Copenhagen Cooking and Food Festival in Denmark, ExpoMilano in Italy and others. Developing an innovative, simple and elegant cuisine, Kamilla Seidler has been the first female chef invited to participate in the International Council of the Basque Culinary Center in 2014, she is a member of Det Danske Gastronomiske Azademi (Danish Gastronomy Academy) (2015), has been recognized as 2016 Latin America’s Best Female Chef, and the Best Chef in South America in 2014. She has received several other international awards for her work and her life dedicated to spreading a message of respect, dignity and pride through the food, a dedication recognized by institutions of the prestige of the Basque Culinary Center that selected her as one of the finalists of the 2016 Basque Culinary World Prize, meant to recognize chefs with transformative initiatives around the world. WG Magazine catches up with Kamilla Seidler… Your cuisine is unique, a vision to guide guest through Bolivia without having them move from their seats… I believe that all cooks build up a library of flavours and memories around food and that is what you use when you make new dishes. When you are suddenly introduced to a whole new world of ingredients that you don’t know and have never seen before that’s when it gets exciting (and difficult). Suddenly you are back to your knowledge on cooking techniques but having to go through all these new flavours. We started to learn the Bolivian ingredients with the team and started to understand how they best work and from there mixing with know-how on how to create the most interesting plates contemplating Bolivian culture and tradition without doing a traditional restaurant. You started your career working at some of the best restaurants… Working with the team in Mugaritz as a very young and unexperienced cook was without knowing the best decision I have ever made. It was again pretty casual and I honestly didn’t have any idea of the importance of that very special place when I arrived. I learned the difference between being a cook just to have a job and being a cook because it’s a part of who you are. The eye for detail and the seriousness of the place mixed with smiles and good colleagues made me understand that this was the profession that I wanted to dedicate my life to. As in any other restaurant it is not a single person who makes it special but the team. I was lucky enough to be at Mugaritz at a very special time where a lot of very talented people helped me learn and for that I will always be grateful. Dani, Leire, Taty, Llorenc, Santi, Luca, Danny, Susana, Fredy and many many more, are all part of who I am today. Ingredients that inspire you… We work with seasonal ingredients, so every time that changes is exciting. We work with kallampa mushrooms, racacha and the Amazonian fish bagre. In a country as bio diverse as Bolivia, it’s impossible to play favourites. We have new or different products to choose from all the time. Avocado, blue potatoes, fish from the Amazon, quinoa, copoazu, wild vanilla etc. Aloe Vera is something I haven’t been able to make delicious yet. Tunta, the dehydrated potato from the Andes, are difficult to convince foreigners about because of its strong fermented taste. Special cooking techniques… We try to keep the products intact and therefore manipulate as little as possible. We search to use ancient cooking techniques and ferment and smoke a lot. We are doing pastrami of carrots but also something as beautiful as fresh palm marrow doesn’t need manipulation besides being separated with great care one thread at a time. Creativity, Technique or Produce… Produce and creativity go hand in hand, it is fundamental for the kitchen that we run. We like technique but Gustu is also meant to be a restaurant that fits into its context. We can’t afford to be as experimental that people only comes back once a year so we are also going for comfort and always flavour first. What was the feeling to be the 2016 Latin America’s Best Female Chef… Of course very surprising but a great honour being recognized by our colleagues. I’m happy about awards and recognitions because it’s a good indicator for the team but I’m much more interested in the social impact that we can have on the surrounding community. I believe that the award was partly given because of the type of restaurant and foundation that we have been running. enowned not only in South Africa but in culinary circles around the world for her innovative and meticulous approach to modern fine dining – has twice been named South African Chef of the Year at the annual Eat Out Restaurant Awards. Trained at the Prue Leith Culinary Academy, Dartnall has gained a huge wealth of knowledge from her extensive annual travels to some of the world’s finest restaurants, in Italy, Portugal, Madeira, Spain and France. Ever since she can remember she has always been very passionate about cooking and always wanted to be a chef. Inspired by the environment in which she grew up, her home (and Restaurant Mosaic at The Orient) is situated in the beautiful Francolin Conservancy with its abundance of wildlife, birds and indigenous plants. This was her playground where she could experiment and explore. After she completed her studies locally, she travelled to London to gain practical experience and was lucky enough to work with some of the world’s best chefs. On her return from London it seemed only natural for her to open the restaurant of her dreams in an environment that is so close to her heart and blessed that her parents have always supported my passion and helped make her dreams become a reality. She explains: “As a chef it is important for me to know what is happening in my industry across the globe and I enjoy meeting with other chefs, sometimes working with them, and experiencing their creativity. It inspires me to work harder and harder at what I do to ensure that our quality at Mosaic is parallel to what you would encounter in the best restaurants in the world.” But despite her extensive travels, Chantel also takes inspiration from Mosaic’s gorgeous setting in the lush Francolin Conservancy in the Crocodile River Valley. Dartnall and her team have built longstanding relationships with local farmers and suppliers in the area and also grow some of their own produce. Restaurant Mosaic has always been a supporter of sustainable food practices. Dartnall is known for producing nuanced, nature-inspired food to rival the best of French fine dining. She believes it is vital to serve visually appealing dishes that tell a story and start stimulating diners’ senses from the moment the food arrives at the table. She produces dishes that are extraordinarily elegant while bursting with flavour. Flavour pairings are original, unusual and carefully engineered: think rainbow trout served with lime, vanilla and chervil. Sauces are perfectly executed: from classic bisque to a rich jus, all perfectly seasoned and textured. A West Coast lobster dish with citrus beurre blanc and morels, for instance, features a rich sauce that is delicately flavoured to permeate and complement the lobster – an “absolute knockout”, according to Eat Out judge Andy Fenner, who continues “There’s amazing attention to detail, radical technique on display and surely some of the most beautiful plating in South Africa.” The prestigious Eat Out Awards, which celebrate the best of the South African restaurant industry, also placed her renowned venue Restaurant Mosaic at The Orient in the Top 10 Best Eating Establishments in South Africa. “Both times I received this wonderful award were truly unexpected. There was absolutely nothing different about the feeling of pure adrenaline and excitement of hearing my name announced. In 2009 I was still the new kid on the block and Restaurant Mosaic had only been open for three years. Five years later and I believe that both Mosaic and I are better known and established. I believe I am now more deserving of the title than I was in 2009” adds Chantel. WG Magazine catches up with Chantal Dartnall… What was it like starting out as a chef… When I began working in London I was fresh out of college. I had worked in some wonderful kitchens in South Africa during my practical placement such as Ellerman House with Chef Craig McCormack and then Ile de France with Chef Marc Guebert. I was very excited to begin working in the Michelin starred kitchen of Chef Nico Ladenis at Chez Nico Ninety Park Lane and thereafter with Chef Michael Caines at Gidleigh Park. The working hours were intense but it taught me about stamina, dedication and perseverance. The most important lesson I learned, not only in London but also from the local chefs that I trained under, was in regard to consistency. The saying that you are only as good as the last plate you send out of the kitchen was drilled into us at every service in every kitchen I have ever worked in. Nothing except “perfection” was allowed to go out of the kitchen. They were all incredible learning experiences. Your cuisine tells a story which is nature inspired, elegant while bursting with flavours, her attention to details which is visually appealing… I believe it’s vital to serve visually appealing dishes that tell a story and start stimulating the diners’ senses from the moment the food arrives at the table. Your greatest influences in the kitchenâ&#x20AC;Ś It is all about passion, perseverance, perfection and produce! It is important to focus on every aspect of the dish, not only the visual appeal and the perfect balance in taste and texture, but also about the entire experience that the chef is creating for the diner. What is the story that you want your dish to tell? Sometimes assessing something as simple as the cutlery that is presented to eat the dish with can either make or break a perfect dining experience. I have always believed that it is not only the quality of the produce you use that ultimately affects the outcome of the dish but also the passion and energy with which the dish is prepared. When it comes to sourcing my produce it is important to focus on sustainability and sensibility. It is very important for any chef to create a strong bond with his or her suppliers especially the farmers, and the best way to do this is to personally visit the farms where the fresh produce is grown or the animals are raised. Chefs need to have intimate knowledge of their suppliers. We as chefs need to support our local farmers who focus on sustainability, farm free range and organically in spite of the fact that their produce might be a bit more expensive. Produce, creativity or techniqueâ&#x20AC;Ś Definitely produce. More and more chefs are now focusing their attention on nature and the question of how best to capture the perfect balance of each ingredient presented on the plate. More focus is being placed on the sourcing, origin and consistency of ingredients - the ingredients themselves being seen as the ultimate dictator of the quality and success of the dish. You were awarded Chef of the Year in 2009 and again in 2014, what motivates you? It is always a great honour to receive acknowledgement for your hard work, especially in an environment filled with so many passionate and talented chefs. I find what motivates me and my team most is making our customers happy. There is no greater reward than having a customer get up from the dinner table and immediately make another reservation. They are settling the bill while planning to come and visit again. Born in Mérida Yucatán, México, Regina spent her childhood in Mérida and then later in Portland Maine, USA where she learnt classic kitchen techniques and discover local ingredients from Chef Cheryl Lewis and then went on to study at Paul Bocuse Institute in Lyon, France where she obtained a certification in culinary arts and an international bachelor´s degree in Hotel and Restaurant Administration. Regina then went on to do her internship in some of the most prestigious kitchen with Julien Rocheteau at La Table de Lancaster, Christopher Hache at Hotel de Crillon, Gerald Passedat at Le Petit Nice and with Cyril Lignac at Le Quinzieme. Her mum had a big part in Regina becoming a chef, since she was young and she would help her mum cook at a retirement home. She didn’t really relate the word chef with cooking, since cooking for many years at the retirement home she discovered how through food she could make people feel at home and happy and wanted to do exactly that. In March 2014, Regina opened MERCI, a contemporary Mexican-French-American inspired restaurant in Mérida serving breakfast, lunch and brunch with the fresh local produce. “I try my best to always highlight the product I’m working with, and let it speak on the plate. After going to culinary school in France it’s inevitable to apply all the techniques I learned, but mostly I’m very proud of my Mexican culture and especially proud of living in a region like Yucatan, where we have such a rich culinary background. I’m fortunate to be able to mix in a balanced way my Mexican, American and now French culinary heritage” adds Regina. eat it fresh, I did some more research and we have started curating it at the restaurant with salt form Celestún, Yucatán. I’m very happy with the result. We will be soon using it in a homemade pasta dish, served with preserved lemons and asparagus. Special cooking techniques… Dough lamination, I have created on obsession with bread, and making croissants has become the main one. I remember the first croissants we baked at merci, the flavour was good but the technique was very bad, they were so dense and nonflaky, fortunately people were patient. So we kept trying and I do believe we have the best croissant in town. It has been a long and meticulous process. Today we serve a flaky, golden, crispy on the outside, moist on the inside bread. We have understood the variables and learned to master them. Your greatest influences in the kitchen… My heritage, at first having a restaurant called Merci, had people wondering why was I so interested in incorporating my Mexican heritage and they questioned me why I didn’t sell traditional French food, like crepes or onion soup. I feel fortunate enough to have 3 cultures that have been a big part of my life, and I have always been inspired by them, I have come at peace with the thought that I don’t have to have a French restaurant, or American, or Mexican restaurant I can’t get the beat out of these 3 worlds. And for me that is very enriching. Your earliest food memory, flavors from your childhood… Mexican spices, especially those from Yucatán, a traditional snack in Yucatan is freshly cut seasonal fruit with Chile, ground up chili powder, mixed with lemon powder and salt. The balance of the acidity of the lime, the fire of the chili powder and the sweetness of the fruit, made it a refreshing and delicious moment. What keeps you motivated? The team in Merci, I am so proud of the people a work with, and I thrive in making them proud too. I enjoy making them a part of the creative process and growing together. Elizabeth Stevenson is a Dubai London based Canadian Pastry Chef whose journey was a gradual one, she studied music and visual arts when she was younger, and did an undergraduate degree in fine arts at the Nova Scotia College of Art and Design in Halifax, Nova Scotia. After graduating she struggled to make ends meet as a young artist, and took jobs in kitchens to supplement her income. Liz ended up loving the culinary process, since it was very similar to the process used in any other creative discipline. She was using her hands, engaging her senses, and feeding people. It was a wonderful feeling, and very empowering to her as a young person. At some point, she made the decision to ‘do’ cooking as a career, and put all her focus in this area. She moved to Montreal, then from Montreal to London where she worked for a very well-known chef whose kitchen was brutal. The pastry section was the quietest, and she found that she could work very effectively there without getting yelled at (as much). She preferred the methods used in pastry, and so for her next job she specifically sought out a pastry position. The rest is more or less history. “I’ve always preferred working in restaurants, probably because of the rush, but also because I love the delicate balancing act of service; the skills required to make it a success night after night are like performance art” adds Liz. WG catches up with Liz Stevenson… Your desserts are unique creations, creative and complex. One such example is your chicken dessert… The chicken dessert, known as Tavuk göğsü has its origins in Ottoman Turkey, where it was prepared at Topkapı Palace and served to the sultans. It is a signature dish of Turkey, and typically made with cinnamon and milk. You don’t taste the chicken so much – it is more used for texture. The chicken’s protein gives it a texture similar to pannacotta or blancmange. The result is a creamy pudding that is traditionally served on its own, but tastes equally great offset by small bursts of acid, such as berries. Combination of ingredients with different techniques… I’m a fan of strong, bold flavors, like anise, or coffee, cardamom, citrus, saffron. When used judiciously, they can really bring a dish to life, especially if paired with a fatty element to offset their overpowering nature, like cream, caramel or chocolate. So for instance, I love saffron with white chocolate, and cardamom with caramel, and citrus ice creams. Take us through the process of creating a new dessert… It always starts with a vague inspiration of some kind – an image, color, shape, and ingredient or flavor profile. This is then elaborated to form the basis of a dish, and I usually strive to provide context – whether historical, social or placebased. For me this is very important, because it makes the difference between something that people can engage with, rather than simply an inanimate object on a plate. It also gives me a purpose, especially if I can tie that into research or travel, or meetings with suppliers or purveyors. Then, I’ll start to test the flavor profiles, whether they work together. This is followed by recipe development or adaptation, where I’ll test the flavor and texture profiles, and so on and so forth until a dish is complete. This process can go on indefinitely, and I’ve learned over the years that it’s best to start with a very strong idea of what you want to achieve, otherwise the process can go nowhere. I’ll often scrap things after weeks, only to pick them up again successfully a few months later with a different perspective. And sometimes you get lucky – an idea can materialize into something awesome in a matter of days. It helps to surround yourself with talented people – synergy is important. Sweet, Salty, Crunchy, Tangy, your secret to a perfect dessert… I love desserts that engage as many areas of the palette as possible, since I think playing to these taste sensations make for a more memorable and visceral experience. For instance, a tangy yoghurt sorbet with a crunchy salted praline is much more interesting than either of those on their own. I love adding salt to counterbalance sweet, so I use salted nuts in ice creams a lot. Likewise I’m a fan of chili in chocolate, and I love using kunafa pastry with dairy, since it has a crunchy texture like Frosted Mini-Wheats, which was this breakfast cereal I loved when I was a kid. My approach is similar to achieving a balance in cooking – start with a base and manipulate and tweak it until you’re satisfied. In general, using less sugar helps to bring out salt and sour, so I often work first to reduce the sweetness levels to their lowest possible point, and continue from there. What is the next trend emerging in desserts? In general I think we will start to see a lot more Middle Eastern and Turkish influences start to make their way into pastry chefs menus, since a lot of these traditional ingredients and flavors are starting to be more recognized. Outside of restaurants, the trend seems to be towards ‘mono’ desserts, or pastry shops that specialize in just one area. We are seeing this for example with éclairs, and macaroons. Pairings of her desserts and pastries with beverages… There is one dessert I developed for Rüya, made from watermelon and mint (basically a watermelon ice pop) that is especially nice with a glass of raki. The anise flavor of the raki is very complementary to the watermelon. My inspiration for that came from Turkey, where after the meal raki is served as a digestive, and watermelon and other fruit is often brought to the table for dessert. What is your favorite recipe? My personal favorite is an elaboration on a basic pannacotta that was developed for a contemporary Middle Eastern restaurant in Dubai. The ingredients were simple, there was nothing overly technical about the dish but the flavor pairings were golden. It contained sumac and was made from Greek yoghurt, so it was very creamy. It was paired with an incredible saffron honey from Yemen, walnut praline, condensed milk sorbet and saffron pashmak (basically, Iranian cotton candy). The pashmak was bought from an Iranian sweet shop in the neighborhood of Satwa in Dubai, since we couldn’t make it ourselves. The overall taste was sweet, salty, sour and crunchy and cold. Basically, a mouth party. It ended up being the most popular dish on the dessert menu. Your advice to those interested in becoming pastry chefs and how to take baking to the next level for home cooks… Work hard, ask questions. Understand the value of being mentored by those with more experience than you. Read. Take notes. Accept that you might have to take a few steps back in order to move forward. Experiment on your own time and don’t be afraid to make mistakes. Practice, practice, practice. Take it slow and focus on mastering one skill at a time. I am largely self-taught in cooking and pastry and started out with zero ability, working from books like The Joy of Cooking (really!) and testing on friends who were grateful for the free food. If I can do it, anyone can. orn in a country house in la Costa Brava, Catalonia, Iolanda Bustos’ parents were farmers and her mother planted and collected many plants, vegetables and flowers, which was a result in Iolanda mother opening her own restaurant since she had a lot of excess produce. Her mother was self-sufficient, she made her own oil, grape wine, flowers and jams. It seemed like magic to Iolanda as with great affection her mother transformed all that she picked in the countryside. Another interesting aspect is harmony with her cuisine, to make the dish but also the drink. Apart from the flowers, she also make many juices, fermentations and macerations that form the liquid part of the dish. Her last project was wine pairings at a vineyard, while people try wines, they also smell and taste the flowers and edible plants. She started this enogastronomy experience 15 years ago, taking the same landscape from the vineyard to the plate and at the same time the diner can taste the wine. Everything comes from the same landscape, this is pure harmony. WG catches up with Iolanda Bustos... Your culinary experiences which helped to form who you are as a chef todayâ&#x20AC;Ś I have never studied cooking in any school, I started cooking like my mother in the restaurant that was our house, it was a traditional kitchen linked to the field, and the influences of many vegetables. I studied public relations and tourism to have further knowledge, because then I thought I already know how to cook, in the end thanks to having learned communication. I started to spread my hobby which was my kitchen. Many people were interested with me using wild ingredients, they called me to do a daily cooking show on television and the other forms of media to do interviews. They encouraged me to write about my knowledge of wild edible plants, so I went back to university to expand my botanical knowledge. Since then my style of cooking both in my motherâ&#x20AC;&#x2122;s restaurant and in my own has been growing as a plant that you take care of every day. And every day I cook, itâ&#x20AC;&#x2122;s based on that memory that I have since I was a child accompanying my mother to pick and eat herbs and flowers during our walks in the countryside. She may have used 50 different things besides mushrooms and fruits and today I am using almost 500 edible wild species that grow less than 100km from my restaurant. I feel fortunate to have grown in this little paradise, called Costa Brava. Your culinary philosophy… I follow a naturalistic and biodynamic philosophy, I try to get the best of each product, studying new flavours, and my kitchen does not get anything packaged, tight, crushed or preserved, I only receive fresh products. When these products arrive to my restaurant, we give them back their lives with techniques based on biodynamics, we use the medicinal properties of the plants so that a meat gets tender, or even the natural yeasts of the flowers to ferment, always following the lunar phases. My kitchen has two boards: one with the daily production task in the kitchen and the other is the lunar and astrological calendar to prepare all condiments, maceration, fermentations, and desiccated ingredients. In fact, a dish that has been very successful at La Calèndula, is the “Ratafia”, 60 ingredients that are the basis of a popular herbal drink. Each ingredient has been converted into a texture, shape, and elaborated. All together we serve them on a canvas drawn by an artist where each herb, flower and species it represents. With this dish I got the recognition for the best cook of Catalonia 2016. Produce, Creativity or Technique… If you have a creative ideas, you look for the technique, and the technique can be learned or copied. So for me, creativity is the most important thing but above all this creativity makes sense to a philosophy, and makes you grow as a professional and as a person for the benefit of all. You create a distinctive and creative cuisine with ingredients collected daily and create a landscape in every dishâ&#x20AC;Ś The cuisine of La CalĂ¨ndula is like a mirror of our landscape, and the most beautiful thing is that every day it changes, according to the weather, the climate, the places where it has been collected from. If the sea has been good or even there are sometimes ingredients that are only available for a few hours, like the flowers of some cactus. Every morning I do a recollection exercise that serves me as a meditation. My cuisine, it also depends on the day in my lunar calendar as it is influenced by one element or another, if we are under the constellations of air, we will collect flowers for drinks, preparations and other condiments; if the constellations of fire influences us, we collect fruits; if we are under the influence of water, then it is especially good to collect leaves and stems; and if we are under a land sign it will be phenomenal to collect roots. All this knowledge has to be superimposed on the phases of the moon according to whether it is increasing or decreasing or ascending or descending. All this energy is what I use so that my cuisine has that magic in it, may not be seen but it feels, and has the power to thrill to those who try it. Ingredients that inspire you... I am very interested in microorganisms, yeasts, mucilages of plants, even some eggs of different animals and insects. It is surprising the power these microorganisms have in food, big industries has made us believe that they are bad bugs and now we see that they are healthy. I am happy when I can cook with wild food that I pick up every morning, my favourite plant is the Elder tree. I love elderflowers and use them in my dishes as well as in drinks like my famous Sparkling elderflower. The same with the elderberries, I make a lot of sauces and wine with these fruits. Elder tree itâ&#x20AC;&#x2122;s my magical tree! It is one of my obsessions, I tried to cook tadpoles. When I was a child, I walked among the rice fields, full of frogs, and in the spring I picked up all the frog eggs and ate them. Friends of my mother told her that in the past they were eaten with a little garlic which was delicious. As now it is prohibited to hunt frogs, I was looking to build a farm with bull frogs, but everything was very difficult with the health administration, on the other hand the investment is also too expensive and they need a lot of space. But I have a little pond at home and every year I breed my own tadpoles for my personal cuisine that means only at home. Born in Bangkok and grew up in a family that loves food, with the family around the table together, conversations were always based around food. So it was somewhat ingrained in Tam, especially Thai food. She actually found her passion in cooking a little bit later on after she had started university studying Nutrition and Food Science. Yam had the opportunity to visit food factories and labs, and as she was touring these places she felt disconnected to ‘real food’, food that got her family around the table together. It made her realize that what she loved about food was actually the creativity and craftsmanship behind the dishes. To her food was art and science combined so it cannot be view as one or the other. She came back to Bangkok that summer and interned in a kitchen. Everything that she thought she knew about food changed, she fell in love with the intensity, the work load, the pressure in the kitchen. So she switched out her lab coat for a chef’s white! She then went to culinary school in New York and started working her way up the ranks in the kitchen till she ended up at Blue Hill at Stone barns working for Dan Barber. The experience at Blue Hill taught her about the importance of sourcing local and made her have an interest in agricultural systems. It made her understand the importance of sustainable food production so this is at the forefront of her cuisine where farmers play a great role in determining the dishes that she make. Back to Bangkok where Tam works as a private chef, she has her catering company and she host our own pop up events, as well as do private catering for clients. Tam was the very first winner of Top Chef Thailand and this award is a reward for her years of hard work, “Many of us have big ambitions in life. But when we actually try to achieve them, they can turn out to be too much of a challenge. In order to make it to the very top, you need passion and drive as well as skill” adds Tam. WG catches up with Tam Chudaree Debhakam… Your cuisine focuses on organic, local Thai produce, with some traditional Thai flavors… I try my best to draw on my experiences with flavors, I was lucky enough to have travelled to a few countries, eating around because of my family. So I use these experiences and my understanding of flavors. In Thai cuisine specifically though there is a very nice balance between sweet, sour, salty and spicy. I make sure that I start off by having a good balance of all the tastes and if I want to make a statement with one of these flavors I build upon them and I make it very obvious. You have to be bold but also make sure you don’t overdo it. Your culinary philosophy… To showcase the ingredients in its most natural form but to add value by either creating a more interesting dimension or enhancing its flavor. I pick a dish or an ingredient that makes me excited. I think of ways I can enhance it, make it more intense, bolder and more refined. Almost a re-presentation of something I’ve had before but in the least literal sense. It is usually a flavor I’ve had before or just something that I imagine liking and wanting to try. Inspiration can be from anything anywhere doesn’t even have to be food related. Ingredients that inspire you… I recently visited the south of Thailand and this opened up a whole new chapter to Thai ingredients. A lot of the indigenous plants growing in the south are super interesting in both flavor and texture. Your greatest influence in the kitchen… I guess I would have to say the Chefs I have worked with and worked for who have shaped me into the person that I am today. I am very grateful. Your earliest food memory, flavors from your childhood… The amazing braised goose webs noodles in clay pot dish that I use to clean with all 10 fingers and finish it all by myself. I was probably 8 years old. What keeps you motivated? I feel like there are so many things that I still have yet to explore and learn so that thought keeps me motivated. I still feel excited thinking about the things that I want to do so I just need to keep pushing to get them all done! In the past years how has cuisine changed around the world? With all the restaurant awards I think the restaurant scene has changed, Chefs are becoming bold in their cooking, more eager to show their personalities. But for sure different types of cuisines are available everywhere and people are more open to trying new things, there’s certainly much greater competition in the industry. Being a chef is perceived as a glamorous profession, your advice to chefs entering the kitchen for the first time… Glamorous is not a term I would ever use to describe this profession but if you really love it, try to stick with it. It requires a lot of hard work, discipline and passion. For me this job is very fulfilling and I don’t think I could ever imagine doing anything else now but my first couple of years were really tough and it still gets tough some days but you have to stick with it. Like you would with anything in your life that you want to make last. orn and grew up in Mexico City in a family of musicians and cooks. Tamara Chavez’s culinary journey started at her family’s restaurant where she learnt the basics and the love for service began. At 16, she ran out of school since as she was restless and this got her to start working. Her first job was with a fast food chain and from day one there was an adrenaline rush, she just wanted to finish doing the burgers. All the staff moved their hands to incomparable rhythms and she knew that this was her world and she would be doing this for the rest of my life. After she changed restaurants, she decided to sell tacos and it was one of the best experiences as she traveled through Mexico City in a car full of ingredients to make tacos! Her mum decided that she should study the culinary arts and Tamara went on to get a diploma in Tourism and finished a degree in gastronomy. She started to read about different chefs in Mexico and around the world, the amazing things they do with food and she knew that at some stage these chefs practiced abroad, one of her uncles spoke to her about Singapore and the opportunities. It was the opportunity and Tamara was interviewed by Remy Lefebvre or Mero Mero. “I started my story in Asia, this was not easy work. I came to a very competitive country and the only thing that was on my mind was that I was not going to return to Mexico, then for reasons I changed my job and arrived in the Latin Quarter. I had never tasted Latin American food but I learned and I liked it a lot, the Venezuelan arepas and the Peruvian ceviche” adds Tamara. WG catches up with Tamara Chavez Lopez… Your culinary philosophy… I do not think much about what can be done, I just start with the ingredients that I want to use, then how it could affect the stations of the kitchen and even though it is my dish I cannot be all on my own, I need my team so that they feel confident and comfortable to work it, then I try it alone if I like it and I think it can work I give it to my team and they give me suggestions or tell me their opinions, I readjust it and then we put it first in the specials and if you like you can get to go on the next menu. “The inspirations – it’s the music, whenever I go to the kitchen to do specials, I really like to put different rhythms of music that makes me feel good and I can think of many ideas” The cuisine at Tono Cevicheria… I think that depends on the dish, at Tono Cevicheria our star dish is the Ceviche in which you must have a balance for tiger milk between the taste of vegetables, lime, chili and salt. When the new guys come to work with us, the first thing I tell them is that they need 3 rules, the first patience they did not grow with the flavors of Latin America and it will take time for them to adapt, secondly, to try everything that will warm their palate to new flavors and the third rule they have to come to eat at the restaurant as clients since they can have a more complete idea of the dishes and they will understand the gastronomic experience enjoyed by the diners. I particularly enjoy eating in Tono to better understand the flavors and balance between the dishes that we have in the menu and I can give better recommendations to our customers. Ingredients that inspire you… I like working with fresh ingredients, at Tono I work with everything - fish, seafood and shellfish. I have a particular interest in sustainable and seasonal products, I think that adds value to our menus. However, I really like working with the ingredients of Mexico because I think that many times they have not been given the value they have and they are not used in all their fullness but at the same time I always let myself be surprised by new culinary experiences. Special cooking techniques… I like working with the grill a lot since I think it can give a lot of flavour to the food and you can work at different temperatures, one of the ceviche’s that were created in Tone is the green ceviche where we make a sauce from grilled jalapeno pepper. It gives a very particular flavour and has quickly became one of the most popular ceviche’s in the restaurant. Your earliest food memory, flavours from your childhood… Chicken soup my mum does, cooking only her favourite food therefore everything that is my childhood is reduced to this dish. Lemon and chili - everything becomes very rich with these flavours, my favourite things after work is to get home and eat potatoes chips with chilli and lemon.